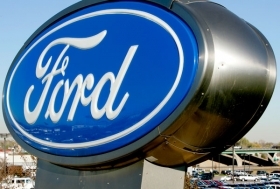 Ford of Europe lost $550 million in the first quarter. MOSCOW -- Ford Motor Co unveiled plans to nearly treble its production capacity in Russia alongside local partner Sollers, increasing its foothold in a market it hopes to double by the middle of the decade. The company, which signed a letter of intent to team up with Sollers in February, signed the 50-50 joint venture in the company of Russian Prime Minister Vladimir Putin in Moscow on Wednesday. The deal will see Ford's Russian operation combine with Sollers to produce 350,000 vehicles a year by around 2014 -- enough to take advantage of a government incentive waiving import tariffs on components. The plans include adding the Ford Transit van to its Russian production portfolio, the first in a line of new products to be rolled out in coming months. The joint venture will assemble six Ford models, including the Focus, Mondeo, Transit and new models to be launched in 2012 to 2014, according to a Russian government factsheet distributed to reporters. In six years, at least 60 percent of the components will be made locally. "There will be a number of new models, some of which will be exclusively built in Russia," Stephen Odell, Ford's European chief, told reporters. By the middle of the decade, Russia's car market may exceed 4 million vehicles, making it the largest in Europe, Odell said. Ford is one of several foreign carmakers looking to sign partnerships in Russia to take advantage of state-sponsored incentives, part of the government's plan to strengthen its manufacturing base ahead of any future crisis. Renault owns 25 percent of Lada-maker AvtoVAZ, while Volkswagen and General Motors have both done deals with Russia's GAZ Group. Currently, Ford today has the capacity to produce 125,000 vehicles a year at its single plant outside St Petersburg. It built around 80,000 Ford Focus and Mondeo cars there last year, selling just over 90,000, while Sollers, the second-biggest Russian producer behind AvtoVAZ, sold 98,000 cars and light commercial vehicles in 2010. Russia's car industry has revived after coming close to total collapse in 2009 as demand for vehicles halved. Russian car sales are forecast to total 2.35 million in 2011, according to the Association of European Businesses, up from 1.97 million last year. Ford's Odell said he hoped the market would double from last year's total by the mid-point of the decade, a forecast more bullish than most, and said the Sollers deal would help Ford boost market share at the same time. "Right now the forecast for mid-decade is 4 million. At that point you can expect a very high utilization of that capacity (350,000 a year)," he said. "But we have lived through a recession and we need to be flexible in our approach to demand." Odell said Ford's historic market share in Russia has been 7-10 percent, a position likely to improve with increased capacity. Ford said earlier this week it would look to expand its presence in emerging markets such as India and China as part of a long term growth plan. Russia's sales of new car and light commercial vehicles expanded 60 percent in the first five months through May to 989,013 units, the Moscow-based Association of European Businesses said on Wednesday. Sollers dropped a planned partnership with Fiat, agreeing in February to set up the 50-50 venture with Ford because of the importance of distribution as well as an industrial alliance, the Moscow-based company said at the time. Sollers is ready to produce Fiat cars while its plants have free capacity, Sollers said on Wednesday.